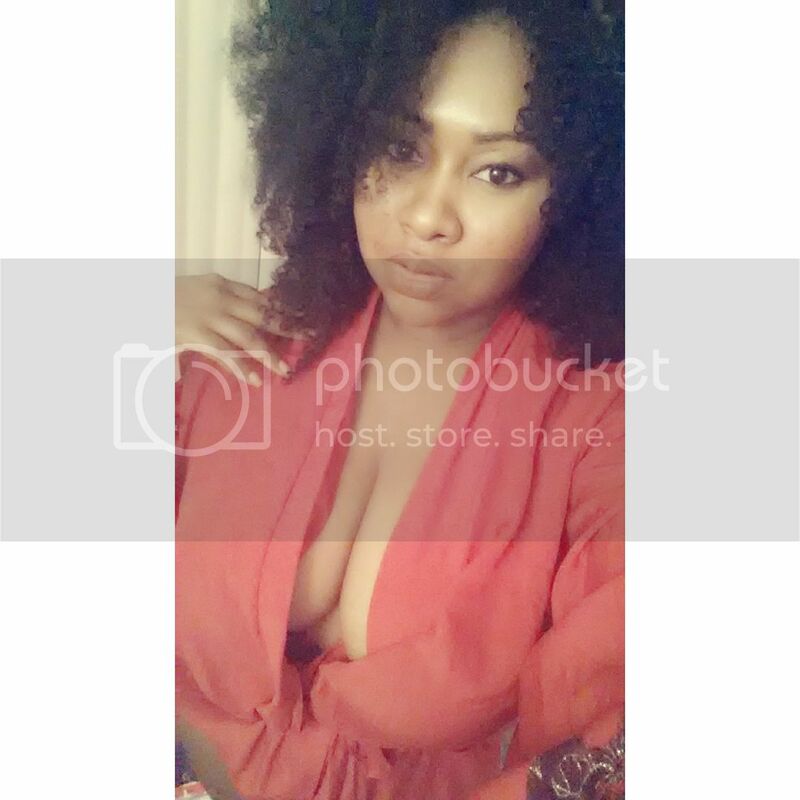 Points: 46057 Topic: Caribbeans: Telling us what we already know news.. 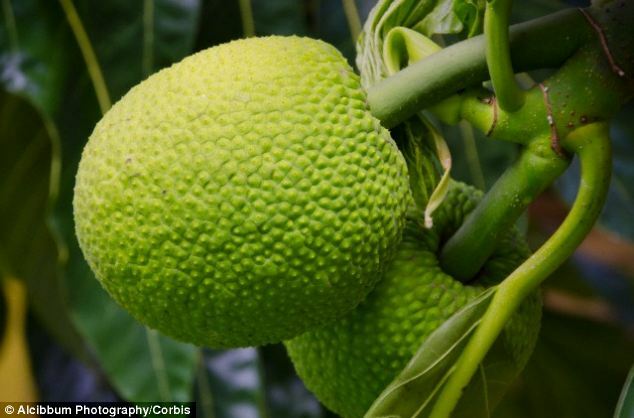 It may not be a fruit that you automatically reach for in the supermarket, but the large and exotic breadfruit is being touted as a wonder food. Known by its Latin name, artocarpus altilis, the fruit has lumpy green flesh and a potato-like texture so that it can be served as part of a main meal or turned into sweets. It was once a staple in the Jamaican diet and now experts believe it could provide food security on the island, which imports more than half of its food. The fruit is widely eaten throughout the Pacific Islands and more breadfruit are produced per hectare than rice, wheat and corn, New Scientist reported. Just one breadfruit, which weighs around 7lbs (three kgs), provides the carbohydrate portion of a meal for a family of five. The fruit can be ground into flour and used in sweet and savoury dishes, including pancakes and crisps. It is rich in vitamins and minerals, as well as being a high source of gluten-free carbohydrate and protein. The protein in the fruit has a higher proportion of aminio acids than soy. Diane Ragone of Hawaii’s National Tropical Botanical Garden (NTBG) has been studying the plant since the 1980s, which some people say is bland and starchy. Mary McLaughlin, founder of the charity Trees that Feed, said that the high-protein fruit can be used to make pancakes. A third of a cup of breadfruit flour is added to the same quantity of orange juice as well as one egg, cinnamon, nutmeg and vanilla. The mixture is fried in a pan and this recipe makes pancakes for three people. 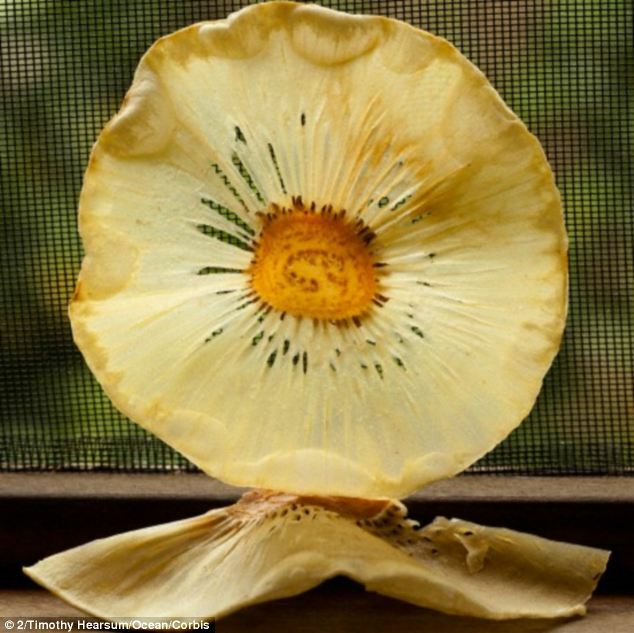 Breadfruit crisps and pasta are being developed so that the food can be more easily stored. The NTBG said that mature breadfruit is a healthy substitute for any starchy food such as rice and potatoes if it is boiled, steamed or baked. Small immature fruit can be boiled, pickled and marinated. They are said to taste like artichoke hearts. Ripe fruits are creamy and sweet and can be eaten raw or used to make cakes and pies. Even the flowers found on the trees can be candied and eaten as sweets. She has studied hundreds of varieties from 34 countries. Together with Nyree Zerega of Northwestern University in Chicago, she traced back the roots of the fruit using DNA analysis to the breadfruit ‘Eve’. 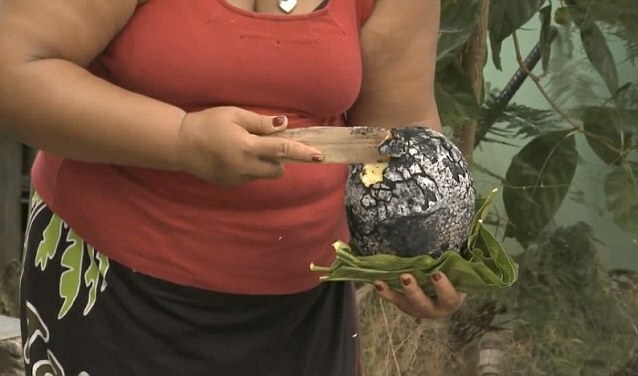 Most of the fruit she examined included fingerprints of a plant called the breadnut that grows in New Guinea. The breadnut is thought to be the ancestor of the breadfruit. In 2003 Dr Ragone created the NTBG’s Breadfruit Institute, which includes an orchard on the island of Maui. Scientists there are working with the charity Alliance to End Hunger with the aim of distributing breadfruit to places without a regular supply of food across the world. ‘Traditionally in Polynesia you would plant a breadfruit when a child was born, because that would guarantee food throughout the child’s life’ Dr Zerega said. 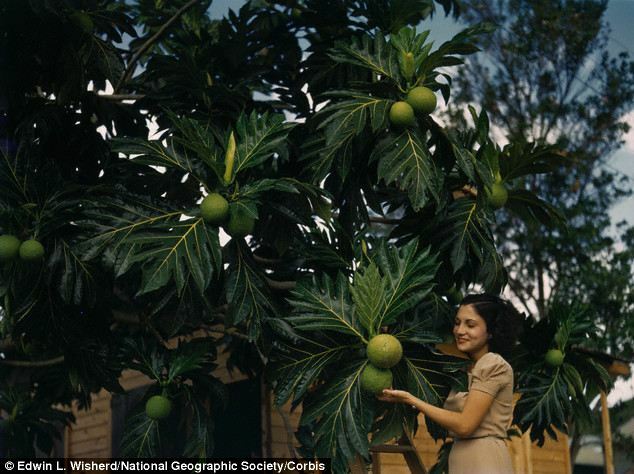 Breadfruit trees require little care and thrive in the tropics. Now experts are investigating which varieties best suit certain environments and climates – as well as local tastes – in countries lacking food security. Breadfruit was first bought to the Caribbean in the 18th Century to feed slaves. Lieutenant William Bligh first bought the fruit to Jamaica from Tahiti. It is said that on the way, his crew mutinied and set him adrift, dumping the cargo of breadfruit plants overboard with him. On his second attempt as a captain in 1792, he brought 2,000 of the plants to Jamaica and 678 bore fruit. Intended as a stable and cheap food for slaves, breadfruit was not much liked and it took around 50 years for it to be incorporated willingly into local dishes. Scientists think that the fruit's ancestor is the breadnut, which is native to New Guinea. Breadfruit is so called because of its high carbohydrate and fibre content. When it is just ripe enough to eat, it is more like bread as it is starchy and dry, but when it is softer and riper it tastes sweeter and is more moist. They are also identifying which varieties of the fruit produce the best yields and protein content. They think that some of the fruit are highly tolerant to salt, which could prove important in the Caribbean as sea levels rise. 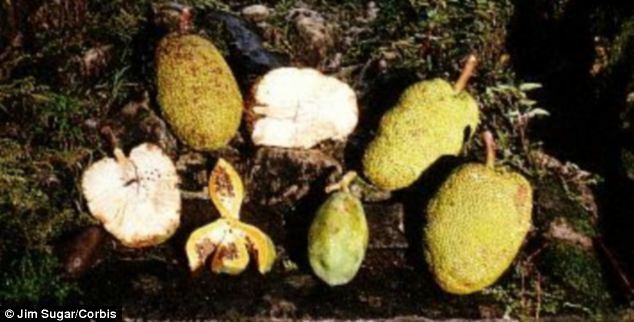 However, some varieties of breadfruit relied upon by people in the eastern Pacific are proving to be less robust. Scientists are trying to use tissue culture methods to create breadfruit trees that yield more fruit sooner. While progress is difficult, the experts have grown disease-free trees that start bearing fruit at two years of age – three years sooner than is usual. From the varieties propagated, 35,000 trees have now been sent to 26 countries, including Jamaica and Haiti. A variety called Ma’afala, which is native to Samoa, bears fruit a different time to varieties found in the Caribbean, extending the time when the nutritious fruit is available. It is hoped that one day there could be forests of breadfruit trees throughout the Caribbean. interesting. does it taste yucky? i'm always looking for healthy foods high in protein. i dont like breadfruit. is this the next food that white people gonna act like they dicovered?? are they gonna mass produce it to the point that its pumped full of chemicals and pesticides that you cant even eat it anymore? i've had breadfruit in a soup. was good to me.